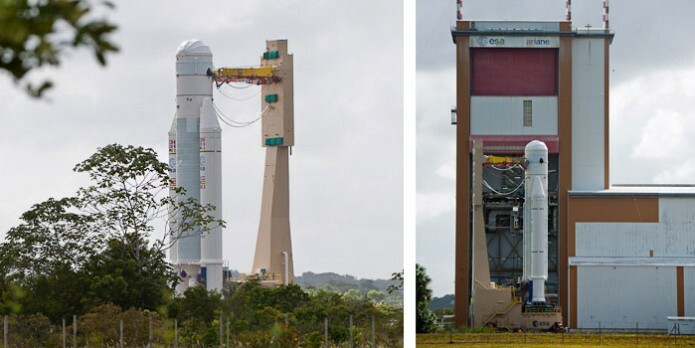 The Ariane 5 for Arianespace Flight VA221 is shown during transfer, moving on its mobile launch table (photo at left) from the Spaceport’s Launcher Integration Building to the Final Assembly Building (photo at right). Arianespace’s sixth Ariane 5 for launch in 2014 is now ready to receive its two satellite passengers after this workhorse vehicle was moved to the Spaceport’s Final Assembly Building in French Guiana. The Ariane 5 rolled out yesterday from the Launcher Integration Building – where its core cryogenic stage, two solid boosters and cryogenic upper stage were mated by industrial architect Airbus Defence and Space – to the Final Assembly Building for delivery to Arianespace. 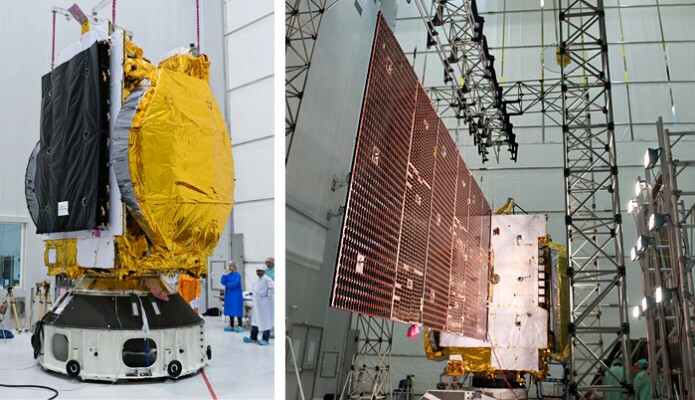 Now under Arianespace’s responsibility, the launcher is set for integration of its payloads – the Indian Space Research Organisation’s (ISRO) GSAT-16; and DIRECTV-14, which was built by SSL (Space Systems/Loral) for operator DIRECTV. This activity will be followed by the final verifications and subsequent transfer to the ELA-3 launch zone in advance of the scheduled December 4 liftoff. This upcoming heavy-lift flight is designated VA221 in Arianespace’s numbering system, signifying the 221st flight of an Ariane family vehicle since 1979.